They're what makes Taste of Home one of America's most popular -- and most trusted -- names in home cooking. Over the years, we've featured tens of thousands of recipes in our magazines and on our website. But you'll find the very best of those dishes, 1,485 of the most beloved recipes, injust one place -- right here. 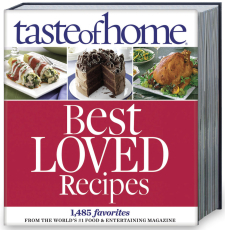 Taste of Home Best Loved Recipes includes 26 chapters covering everything from appetizers and beverages to entrees and sides, breads and desserts. You'll find must-have comfort foods, potluck and bake-sale favorites, secret family recipes, and special features spotlighting our Grand Prize Contest Winners, Favorite Contributor Meals, and the Top 100 Recipes from our first 20 years. Each recipe includes everything that millions have come to love and expect from Taste of Home -- easy, everyday ingredients, step-by-step instructions, prep and cook times, tons of can't-fail cooking tips, and 400 gorgeous full-color photos. Come join our community and discover your own favorite recipes! You'll be glad you did -- and your family will reap the delicious benefits that can only come from home-cooked dishes made with care and love.